Interested in networks, and looking for an exemplar that I could do in my class, I turned to the Portable Antiquities Scheme database, and extracted coins known to have originated from the mint at Sirmium (modern Sremska Mitrovica, Serbia). You can find the list here. I downloaded the data as a CSV. 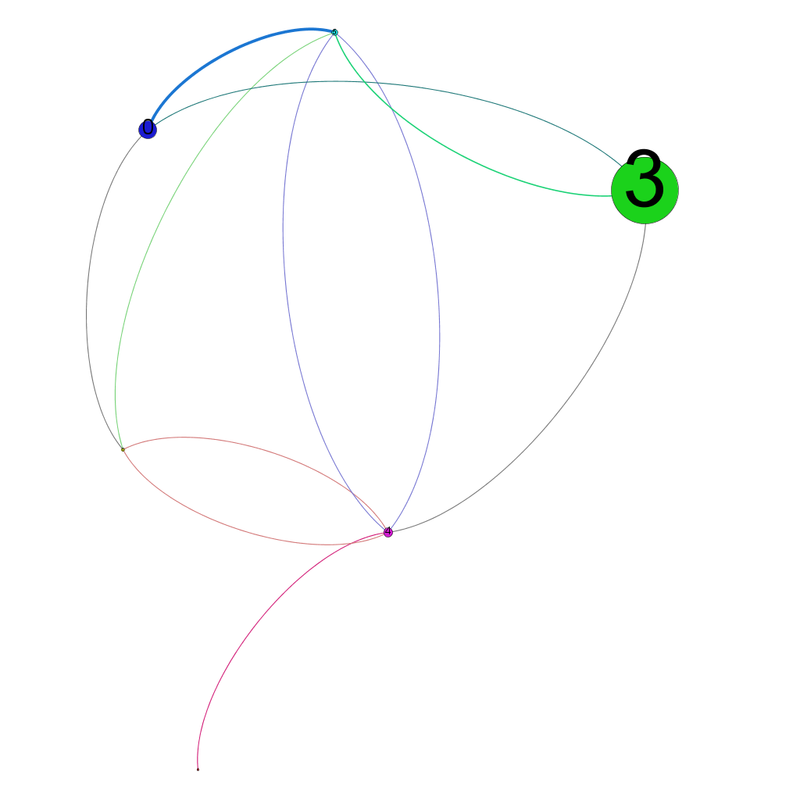 Looking at it, it seemed to me that a multimodal graph of coin to findspot, to material, to date, and to ruling house might be useful (and of course could be transformed into single mode graphs as necessary). So I made a list, where the 21 coins were marked ‘source’ and the other data were marked ‘target’ (which means that I repeated the coins four times in my list). 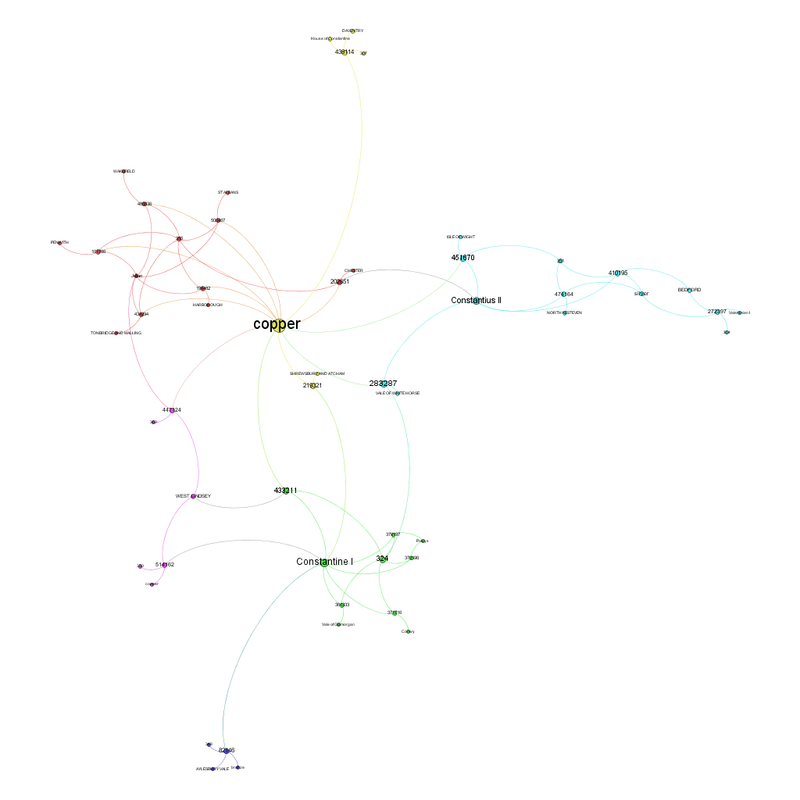 Here is the resulting network in a zoomable pdf: coins from Sirmium in the UK – PAS. I ran modularity and betweeness centrality. Most central nodes were ‘copper’ as a material, Constantine I and II, and then coins 283287 and 433211 and the date, AD324. If you revisualize the graph so that the communities are grouped into single nodes, the most ‘between’ of these communities is group 3, which has the following data: coins 410195, 272397, 451670, 474164, 283287, silver as a material, Constantius II and Valentinian I, and Bedford, Isle of Wight, North Kesteven, and the Vale of White Horse. Coins from Sirmium, a networking experiment. Shawn Graham. figshare.